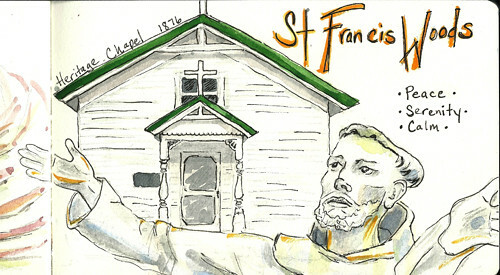 St. Francis Woods Sketch – Let's Paint Nature! Being a hectic weekend, I couldn’t get out, so these sketches are from photos of last weekend at St. Francis Woods. 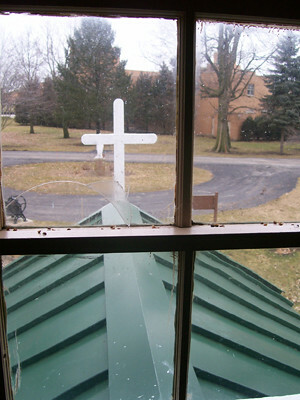 St. Francis Woods is a peaceful place which holds a retirement building for nuns. A highlight of the grounds is a wooded lot which runs along Hickory Creek. 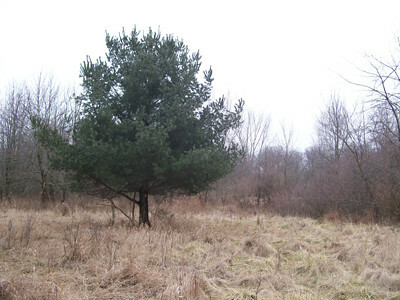 This is where I found a tiny plot of pines and the owl pellets. They have many programs and even cottages for a secluded retreat (must check into that!). 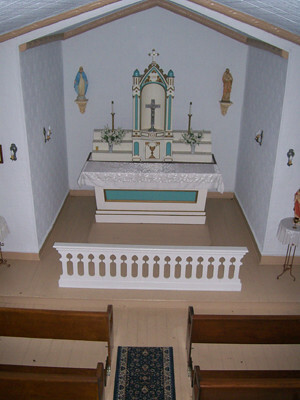 They also have an 1876 chapel, stations of the cross, and a labyrinth to visit. 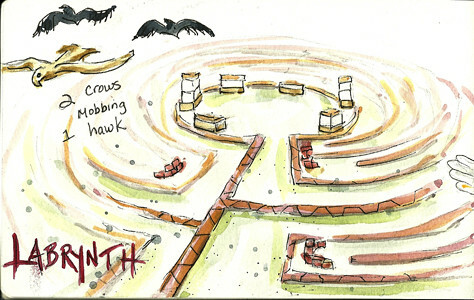 Yes, I spelled labyrinth wrong on my sketch! Isn’t the first, wont be the last…hahahaha! Despite my spelling this structure is very intriguing. There is only one path to the center. Walking this path with no short-cuts reminded me of life. Sometimes you don’t get very far, but are repeatedly turned around very quickly. Other times you gain great distances and time. This is how life is. Sometimes life throws you around and you do not see the end path or the purpose. And then other times you seem to accomplish a lot and feel good. Neither are bad, neither are good, they are all on purpose from the Creator of your path and you must just go through it, trusting that the Creator has a purpose and a lesson for us to learn. 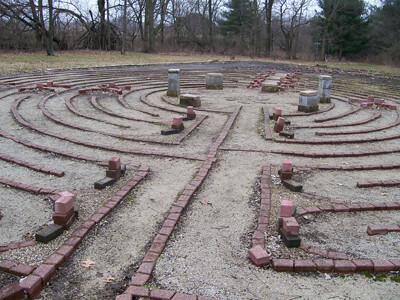 The Labyrinth took about 15 minutes to complete…no cheating! In the center you are suppose to say 6 prayers, then exit on the same path. 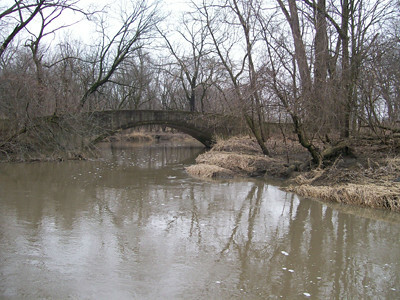 Here is Hickory Creek. It was flowing pretty fast and had a lovely trickle sound. Here is one pine of a group which the owl pellets were found. This picture will be a painting one day. I love dilapidated statues. The ones which are weathered and worn have such character. 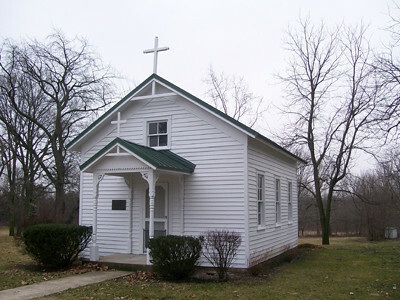 This is tiny and cute Heritage Chapel, which was dedicated in 1876. It’s charming and is in working order. 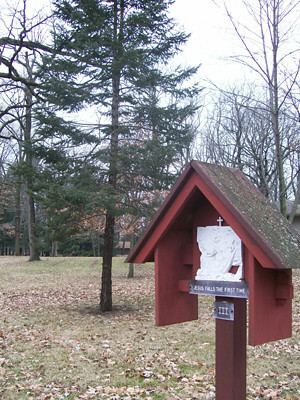 And finally, one of the stations of the cross which you can visit along a paved path and revisit Jesus’ death and resurrection. 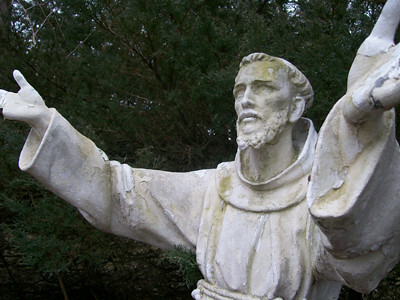 St. Francis Woods is a very neat nature and spiritual place to visit. Highly recommended! If you take LaGrange Road south to St. Francis road (about 25 mins), turn left. Keep going east for about 1 mile or less, on your right hand side will be St. Francis. Turn right on the driveway and stay right. From the parking lot you can see the stations of the cross. Walk the paved trail. At the end look left and you will see a trail into the woods. Oh how much fun!!!!! Yes!!!!! Please join us sketcing. The next LRS sketch day is Saturday Feb. 25th at 9am. It would be great if you could join!!! Lovely photos and sketches. The peace and tranquility of SFW comes across quite clearly in your beautifully laid out virtual tour– thanks! “stand out in the rain more often…” HA HA HA!!! LOL. Thank you! We need to get together soon and do some painting! It is always a privilege to accompany you, Christine, on your nature hikes. I learn so much by watching and you make every place you paint so Sacred. Thank you for allowing me to spend this time with you and I look forward to another new adventure at LRS on Saturday, Feb 25th. I wonder what we will paint???? Alanna! I learn just as much from you as well. What a gem of a place you have shown me! Thanks!!! Can’t wait for Saturday. Christine, You always have a wealth of information to share as well as pictures and paintings to delight. I love to visit with you.